Dreamworld has welcomed Australia’s most talked about Illusionist, Cosentinofor two weeks of awe-inspiring and extraordinary magic. 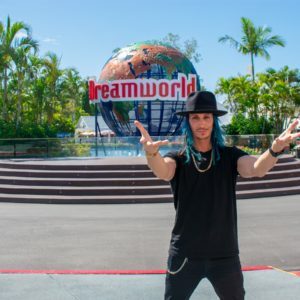 Kicking of the school holidays, Cosentino, The Grand Illusionist took to the stage in the Dreamworld Exhibition Centre (DEC), which has been transformed into The Cosentino Theatre for his theme park debut on Saturday 6 April in a run which will last until Sunday 21 April. The show includes death-defying escapes, mind boggling stage illusions and cutting-edge street magic. Dreamworld guests can experience the show as part of their general park admission of Dreamworld Pass and select between two shows daily at 11.30am and 2pm. Fans should keep an eye on the Dreamworld Facebook page for giveaways to meet the illusionist himself with dozens of ‘Meet and Greets’ to give away in the coming weeks. Cosentino has not only reinstated, but reinvented magic in Australia and internationally, says Dreamworld – deemed as a unique and brilliant entertainer whose performances are a quantum leap forward in the art of magic and illusions. Add to this a day of fun and excitement at Australia’s largest theme park and you have the perfectfamily holiday destination with an array of thrill rides, DreamWorks Experience, ABC Kids World, wildlife and Indigenous culture, the world-class Tiger Island and access to WhiteWater World included.